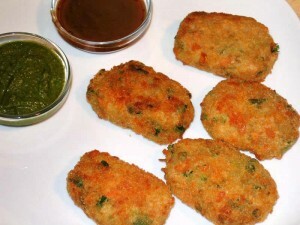 Cutlets recipe by Ayesha Khan at PakiRecipes.com. Boil the potato and crush the peas in the mixer. Cut the onions, carrots, cabbage into small pieces. Now place a pan and put 1/2 tbs of oil and place the onions into it.Let the onions become dry.Add this to the mash potatos. Do the same with carrots and cabbage and peas.Mix all the ingredients. Add ginger paste and green pepper paste into it. Also add garam masala and salt as required. Give the shape of the heart if u have the object to shape it or else u can shape it as u like. yah its quite simple .